Diwali or Deepawali is the festival of lights and lamps. Every year, it is celebrated with great pomp and show not only in India but in the world as well where ever there are Indian communities living together under a single roof or a colony. As per the nomenclature, Diwali or Deepawali means an array of brilliantly burning earthen oil lamps whose luminescence dissipates the darkness of the night. Diwali falls on the full moon night (Amavasya) of the month of Kartik (October-November). As per the ancient Vedic scriptures like Ramayana, the celebration of Diwali marks the return of Lord Ramchandra, the supreme personality of godhead back to Ayodhya Dham with her eternal consort Srimati Sita devi after an exile of 14 years. As per the Lord’ divine past time, his step mother Kaikayi asked his father Maharaja Dashratha to coronate her son Bharat as the next heir and send Ramchandra for an exile of 14 years. SB 9.10.32 — After giving Vibhīṣaṇa the power to rule the Rākṣasa population of Laṅkā for the duration of one kalpa, Lord Rāmacandra, the Supreme Personality of Godhead [Bhagavān], placed Sītādevī on an airplane decorated with flowers and then got on the plane Himself. The period for His living in the forest having ended, the Lord returned to Ayodhyā, accompanied by Hanumān, Sugrīva and His brother Lakṣmaṇa. SB 9.10.33 — When Lord Rāmacandra returned to His capital, Ayodhyā, He was greeted on the road by the princely order, who showered His body with beautiful, fragrant flowers, while great personalities like Lord Brahmā and other demigods glorified the activities of the Lord in great jubilation. SB 9.10.34 — Upon reaching Ayodhyā, Lord Rāmacandra heard that in His absence His brother Bharata was eating barley cooked in the urine of a cow, covering His body with the bark of trees, wearing matted locks of hair, and lying on a mattress of kuśa. The most merciful Lord very much lamented this. SB 9.10.35-38 — When Lord Bharata understood that Lord Rāmacandra was returning to the capital, Ayodhyā, He immediately took upon His own head Lord Rāmacandra’s wooden shoes and came out from His camp at Nandigrāma. Lord Bharata was accompanied by ministers, priests and other respectable citizens, by professional musicians vibrating pleasing musical sounds, and by learned brāhmaṇas loudly chanting Vedic hymns. Following in the procession were chariots drawn by beautiful horses with harnesses of golden rope. These chariots were decorated by flags with golden embroidery and by other flags of various sizes and patterns. There were soldiers bedecked with golden armor, servants bearing betel nut, and many well-known and beautiful prostitutes. Many servants followed on foot, bearing an umbrella, whisks, different grades of precious jewels, and other paraphernalia befitting a royal reception. Accompanied in this way, Lord Bharata, His heart softened in ecstasy and His eyes full of tears, approached Lord Rāmacandra and fell at His lotus feet with great ecstatic love. SB 9.10.39-40 — After offering the wooden shoes before Lord Rāmacandra, Lord Bharata stood with folded hands, His eyes full of tears, and Lord Rāmacandra bathed Bharata with tears while embracing Him with both arms for a long time. Accompanied by mother Sītā and Lakṣmaṇa, Lord Rāmacandra then offered His respectful obeisances unto the learned brāhmaṇas and the elderly persons in the family, and all the citizens of Ayodhyā offered their respectful obeisances unto the Lord. SB 9.10.41 — The citizens of Ayodhyā, upon seeing their King return after a long absence, offered Him flower garlands, waved their upper cloths, and danced in great jubilation. SB 9.10.42-43 — O King, Lord Bharata carried Lord Rāmacandra’s wooden shoes, Sugrīva and Vibhīṣaṇa carried a whisk and an excellent fan, Hanumān carried a white umbrella, Śatrughna carried a bow and two quivers, and Sītādevī carried a waterpot filled with water from holy places. Aṅgada carried a sword, and Jāmbavān, King of the Ṛkṣas, carried a golden shield. SB 9.10.44 — O King Parīkṣit, as the Lord sat on His airplane of flowers, with women offering Him prayers and reciters chanting about His characteristics, He appeared like the moon with the stars and planets. SB 9.10.45-46 — Thereafter, having been welcomed by His brother Bharata, Lord Rāmacandra entered the city of Ayodhyā in the midst of a festival. When He entered the palace, He offered obeisances to all the mothers, including Kaikeyī and the other wives of Mahārāja Daśaratha, and especially His own mother, Kauśalyā. He also offered obeisances to the spiritual preceptors, such as Vasiṣṭha. Friends of His own age and younger friends worshiped Him, and He returned their respectful obeisances, as did Lakṣmaṇa and mother Sītā. In this way they all entered the palace. SB 9.10.47 — Upon seeing their sons, the mothers of Rāma, Lakṣmaṇa, Bharata and Śatrughna immediately arose, like unconscious bodies returning to consciousness. The mothers placed their sons on their laps and bathed Them with tears, thus relieving themselves of the grief of long separation. SB 9.10.48 — The family priest or spiritual master, Vasiṣṭha, had Lord Rāmacandra cleanly shaved, freeing Him from His matted locks of hair. Then, with the cooperation of the elderly members of the family, he performed the bathing ceremony [abhiṣeka] for Lord Rāmacandra with the water of the four seas and with other substances, just as it was performed for King Indra. SB 9.10.49 — Lord Rāmacandra, fully bathed and His head clean-shaven, dressed Himself very nicely and was decorated with a garland and ornaments. Thus He shone brightly, surrounded by His brothers and wife, who were similarly dressed and ornamented. SB 9.10.50 — Being pleased by the full surrender and submission of Lord Bharata, Lord Rāmacandra then accepted the throne of the state. He cared for the citizens exactly like a father, and the citizens, being fully engaged in their occupational duties of varṇa and āśrama, accepted Him as their father. SB 9.10.51 — Lord Rāmacandra became King during Tretā-yuga, but because of His good government, the age was like Satya-yuga. Everyone was religious and completely happy. Since the atmosphere is highly contaminated due to the presence of dead bodies of night flies, the flies which keep on rotating and encircling around the lamps, the earthen lamps when burnt release soot or carbon black which is a very nice absorbing agent. It absorbs all the polluted gases and makes the environment clean. This entry was posted in Puja and tagged celebration, Deepavali, Deepawali, diwali, Festival, festival of lights, festivals, hinduism, Lord Ram, Shubh Deepavali, shubhpuja, shubhpuja.com. Dussehra, as the name suggests is the tenth day of the Navratras of month of Sharad i.e. September-October and hence, marks the portion of the year when the sun relaxes the earth from it’s scorching rays and cold winds start wrapping the atmosphere of the Northern Hemisphere. In the evening, one must offer prayers to Ram darbar and one must offer bhoga to them. One must collect the burnt wood from the effigies and store them in the house to ensure peace. It is celebrated every year since time immemorial by burning the effigies of Ravana, Meghanada and Kumbhakarna, the three demons who performed great austeriries to please the Lord. But there are some facts about Dussehra which are still unknown to us. It was Agni Sita who sat on the tail of Sri Hanumanji and burnt the whole Lanka instead of Hanumanji. Ravana and Kumbhakarna were actually the two gatekeepers of Lord Sri Hari namely, Jaya and Vijaya who took the form of enemies of Lord to assist him in his past times. Despite Lord Ramchandra knew about Amrit Kalash, still Ravana was invincible. Lord Ram chanted Aditya Hridaya strota to get the power to kill Ravana. Jambavant who appeared in Ramayana lived long to meet the next form of Lord Krishna, he himself. He presented to him, his daughter, Jamvanti. Though Sri Hanuman was a strict celibate, still a female alligator bore progeny out of his sweat drop. Ramayana was completed before the happenings of the actual Ramayana. But Mahrishi Valmiki never disclosed it to anyone. Sri Lanka is the only place where the idols of Ravana are worshipped. It is a traditional custom to bring the burnt logs of wood of Ravana to kept in home. It ensures peace. This entry was posted in Puja and tagged celebration, celebrations, Dashmi, Dusshera, Festival, festivals, Kumbhakaran, Lord Ram, Rama, Ravana, religion, Science, Shubh puja, shubhpuja, shubhpuja.com, Vedas, Vijaya Dasami, Vijaya Dashmi. Lord Hanuman and Bhima (one of the Pandava brothers) are believed to be the son of Lord Vayu. Bhima took much pride in his physical strength and considered everyone below him. Once during the exile, Hanuman posed before Bhima as an old and frail monkey who was blocking his path. As he was tired, the monkey asked Bhima to remove his tail. Though amused at the request, Bhima went ahead to lift his tail. He tried with all his might but was unable to move the tail even by an inch. Realizing his folly, Bhima apologized to the monkey upon which Hanuman revealed his true identity and just like that lord Hanuman reduced the arrogance of Bhima. This entry was posted in Mythology and tagged bhima, blessings, brothers, divine, faith, Hanuman, have a little faith, Hindu, hinduism, Lord Hanuman, Lord Ram, monkey, pawanputra, rambhakt, religion, shubhpuja, shubhpuja.com. During Rams’s quest to free Sita from the clutches of Ravana it was Hanuman who flew across the sea to reach the demons king’s palace and discovered the whereabouts of Sita. When Ravan became aware of Hanuman’s presence in his palace, he ordered his soldiers to capture and kill the petty monkey. In order to crush Ravan’s ego, Hanuman set about destroying Lanka with his tail that was set ablaze by Ravan’s soldiers. In this commotion he found Lord Shani imprisoned in the palace’s basement, who was cursed by Brahma to remain in captivity till an incarnation of Shiva frees him. Hanuman released him from the confinement. Delighted, Lord Shani helped Hanuman in his pursuit to destroy Lanka and even granted him a boon. Hanuman who always wished well for his followers, asked Lord Shani not to cause trouble for the devotees who worshiped Hanuman. This entry was posted in Mythology and tagged blessings, devotees, faith, Hanuman ji, have a little faith, Hindu, hinduism, lanka, Lord Hanuman, Lord Ram, lord shani, mata sita, puja, Rama, Ramayana, shubhpuja, shubhpuja.com, wishes, worship. Ramayana is the original scripture enumerating the wishes of Lord Rama written by Maharishi Valmiki. Chanting the mantras of Ramayana propitiates all planets and is highly beneficial to listen on the Birthday of Lord Rama that being Ram Navami. Sampooran Ramayana Paath brings most beneficial results in personal and professional life ! 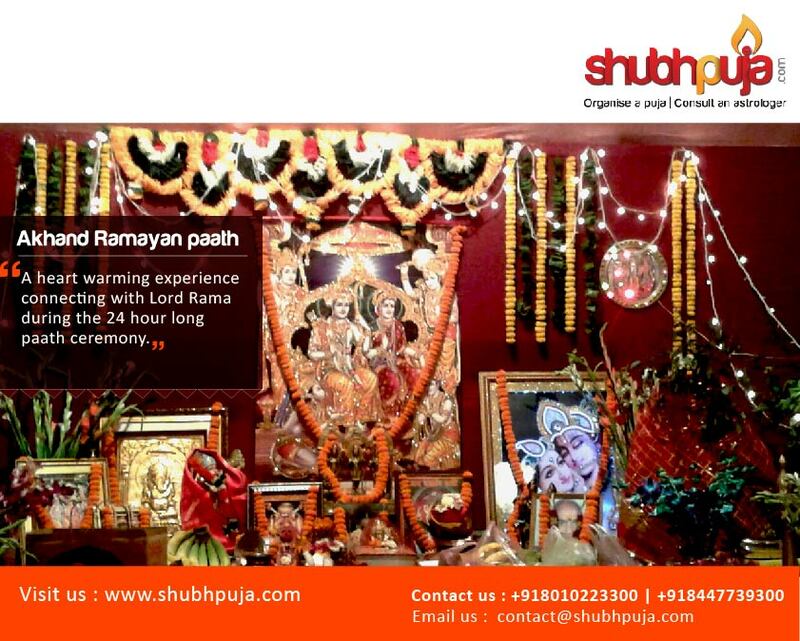 We at Shubhpuja help you have a hassle-free puja and a personalized experience right at your doorstep. This entry was posted in Puja and tagged Akhand Ramayan paath, god, Hindu, hinduism, Lord Ram, paath, pandit, puja, Rama, Ramayan, Shubh, shubhpuja, spirituality.